(1980) "Never Be the Same"
"Sailing" is a 1980 soft rock song written and recorded by American artist Christopher Cross. It was released in June 1980 as the second single from his eponymous debut album (1979). The song was a success in the USA, reaching number one on the Billboard Hot 100 chart on August 30, 1980, where it stayed for one week. The song also won Grammy Awards for Record of the Year, Song of the Year, and Arrangement of the Year, and helped Cross win the Best New Artist award. VH1 named "Sailing" the most "softsational soft rock" song of all time. The song was recorded in 1979, utilizing the 3M Digital Recording System, making it one of the first digitally recorded songs to chart. In his Grammy acceptance speech, Cross acknowledged "Sailing" as his favorite song on the album and that originally it was not meant to be a single. The song was later identified as an archetype of the genre that later became known as yacht rock; Cross and similar artists referred to the style as the West Coast sound at the time. Since its debut, "Sailing" has been covered by artists including Avant, Barry Manilow (on his 2007 album The Greatest Songs of the Seventies), Greenskeepers, NSYNC (on their 1997 album 'N Sync), George Benson, Phajja, Patrick Yandall, and the duo of Moya Brennan & Cormac de Barra. The song was sampled in the Puff Daddy song "Best Friend", from his 1999 album Forever. Cross' version is heard in a 2016 TV commercial for Hyundai. It was featured in a brief scene in the 2006 film Flushed Away. ^ D., Spence; Linder, Brian. "Top 10 Yacht Rock Songs of All Time". IGN. IGN Entertainment, Inc. Archived from the original on June 14, 2012. Retrieved 30 June 2017. ^ Whitburn, Joel (2010). The Billboard Book of Top 40 Hits (rev. and expanded 9th ed.). New York: Billboard Books. pp. 162, 889. ISBN 9780823085545. ^ Jim McCullaugh (November 1, 1980), "Digital the Major Topic For N.Y. AES Parley", Billboard "The Christopher Cross LP, at number 32, uses the 3M digital technology"
^ Kamp, Jon (October 11, 2015). "Can You Sail to It? Then It Must Be 'Yacht Rock'". The Wall Street Journal. ^ Cross, Christopher (February 22, 2014). "Hall & Oates Are Genuine Rock Stars in My Book". The Huffington Post. 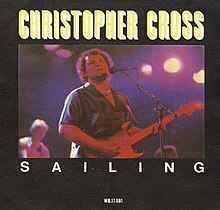 ^ "Ultratop.be – Christopher Cross – Sailing" (in Dutch). Ultratop 50. ^ "Charts.nz – Christopher Cross – Sailing". Top 40 Singles. ^ "Top 100 Singles (1980)". RPM. Archived from the original on 2016-04-25. Retrieved 2017-07-21. This page was last edited on 20 April 2019, at 04:52 (UTC).